FANBOY PLANET.com . : cg-fallscount01172010 :. It's like Back to the Future, Part 2. I always felt kinda bad that I never got to do Falls during the height of the Monday Night Wars. It was well and truly over by the time Fanboy Planet was founded; the real time frame for the Wars was 1995 until late 1999, even though that they kept going for another couple of years. The fact is, Nitro stopped being a threat once they jobbed Goldberg. Maybe that was the reason I was so excited for January 4th, 2010. You see, more than ten years after the final NITRO that meant anything, RAW was going to competition head-to-head and live. It was TNA’s Impact three hour special up against RAW. TNA had the big deal, the debut of Hogan, and ran around looking for everyone they could possibly sign who would mean anything to ratings. 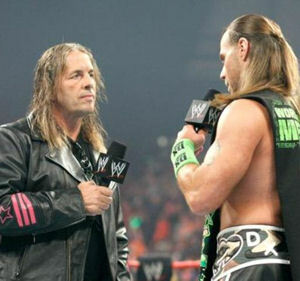 RAW went to a well that folks had been talking about, but fans never thought they’d see: Bret Hart. First off, TNA had some great stuff and some bad stuff. They started with the Asylum cage where you had to climb out of the Occulus up in the roof of the cage. It was filled with great X-Division wrestlers, but in the end, it was Hernandez getting DQed for beating everyone with a pipe. Now, I get it, they wanted these guys to show off their moves, which most of them got to do, but a DQ? I mean really! This should have had an ending that meant something, but maybe it actually did. After the show, the camera cut to Jeff Hardy coming through the crowd and coming to the ring and brawling with Hernandez and then climbing the cage and sitting up top soaking in the cheers. That’s pretty damn cool, but the crowd was chanting how much they hated it. The show was full of hotshot booking. They changed the Knockouts title and the Knockout Tag Team titles, which both felt like they were just done to make the show seem special. They’d have been better off with the matches being longer and keeping them on the champs. Well, the Tag title match was pretty good, but Tara is far better than she’s been allowed to show of late. ODB is a better champion if they’re going to try and run with the WWE, but Tara would be a better champion if match quality is more important. A confession for the camera. The Monday Night Raw return of Bret Hart was amazingly strange. He got a really strong reaction, but it wasn’t what Cena would get or even Undertaker. He did an OK promo, though it was obvious that he hasn’t done one in a while. He talked about things and then he called in Shawn Michaels. The two faced off and Shawn admitted that he was in on it at Montreal in 1997 (we all knew that he was a part of the double cross) and that they needed to put it behind them. I remember reading that they’d already patched things up, so this wasn’t a risk of a shoot, as tantalizing as that would be. Shawn did a helluva promo and then he and Hart shook hands. Then, Shawn started to walk away but paused like he would if he were going to return and give Bret a Sweet Chin Music, but instead he went over and hugged Bret. It was a brilliantly constructed moment and I’m interested to see where they go with it. The entire night had me flipping back and forth, mostly watching TNA and changing over to RAW when things got bogged down. And it being TNA, it did get bogged down. There was way too much Hogan. I missed most of his promo because I was watching Bret on RAW, but I understand it was pretty much what I’d expected. They’d brought back Scott Hall and Sean Waltman (who I heard had turned down TNA a while back) and the Nasty Boys. There was a definite WCW 1997 vibe to the entire show. They made some big mistakes, like having Desmond Wolfe, who has been having great matches with Angle, job to Pope D’Angelo Dinero, who I think is great, a wonderful talker, and a fine worker (I also believe you might remember him as Elijah in WWE), but they didn’t give them enough time to make the match strong enough where either could job and still be elevated. In fact, all the matches were too short, except for the main event. Who will take Melina's title? What I saw of RAW was what we’ve been seeing over the last few months. They have stripped Melina…of her title. She hurt herself and will be out for a few months, so they started a tourney. Seamus and Evan Bourne had a nice little semi-squash. Evan got some nice offense, but really, he was just there to make Seamus look like a champion. It did work. The best match of the night for me was Shawn/HHH retaining their tag titles vs. JeriShow. It was a decent, match. The match of the night was obviously Kurt Angle vs. AJ Styles. This was just a great match, and what would you expect from these two? Angle powerbombed Styles into the turnbuckle like Kobashi does to guys over in Japan. It was awesome. The two traded holds, Kurt kicked out of a couple of Styles Clashes before AJ hit the 450 off the ropes for the win. Good match. If TnA had another match of this caliber (and I’d say it was a 4 star match), it would have been one of the best Monday shows in years. The worst part was the end of IMPACT. It was Mick Foley, who had been barred from the building and had finally weaseled his way in, trying to get to Hogan but running into Bischoff. The two faced off, with Foley doing the ‘I’ll never work for you’ bit up against Bisch’s ‘I am GHOD here!’ thing, but then he was jumped by Nash, Hall and Waltman, with Hogan looking on at the end. That’s right: it’s Nw2.0! There were other surprises. Sean Morley showed up doing his Val Venis gimmick while The Beautiful People were playing strip poker. I always thought that he should have been a huge star but ended up falling into the middle when Rock, Foley, Austin and so on became mega-stars. He was always a good worker and a fun character. The thing is, what does this mean for wrestling as a whole? Hogan helping to run TNA is a bad thing, unless he gives more to the younger talent, and if he had anything to do with the main event, he did put things behind AJ Styles as a champion. There’s no solid thought about moving TNA to Mondays full-time, though if the numbers come in good, it’ll start to pop up more. RAW will almost certainly win the contest big, but if the TNA is good, that’ll lead to Monday becoming the big night for wrestling again. Anyway it goes, I’m excited again.